Carillion’s failure follows a few spectacular recent failures such as British Home Stores in 2016 and Monarch Airline in 2017 which have similar stories of massive debt and looted pension funds. Carillion, however, represents the largest corporate failure in recent UK history. The company has 45 000 employees, 19 000 in the UK, whose jobs are now at risk and 28 000 pensioners whose pensions are threatened. In addition the company has contracted approximately 30 000 sub-contractors who are apparently owed £1bn which they will now never get. Many of these sub-contractor jobs will now also be at risk. Carillion itself owes its banks £1.35bn and has a deficit in its pension fund of £990m . 14 banks have lent money to the firm including the five largest UK banks , and 14 separate pension schemes are involved. The Government now has 450 PFI scheme contracts, which Carillion was executing, and which need to be re-negotiated and refinanced. The state will also have to bail out the pension schemes which will cost a further £800m. Whilst not directly bailing out Carillion, it faces an enormous bill for this failure. A few people have been shamelessly enriched at the expense of workers, pensioners and tax payers. In the last 2 years shareholders have been paid £200 million and this sum has been paid while the company stopped paying into workers’ pension schemes. At the same time the top management helped themselves to millions. The Carillion CEO Howson, for example, who resigned in 2016 after the first profit warning, paid himself £1.5 million in the year 2015/16. In the last year the average profit margin for the top 10 contractors in the UK was – 0.5%, and over the last 5 years profit rates for major contractors have been in the range of -1.7% to 3.6% . Yet in this period Carillion quoted average profit margins of 4.1%. This appears to have been achieved by massive borrowing and crooked accounting. However, cooking the books provides only short term relief. In the longer term the reality of lower profitability reasserts itself. Carillion, however, has been able to postpone the day of reckoning through the massive transfers of wealth it derived from the Public Private Initiative schemes. Although the outlines of these schemes were proposed in 1989 they only became widely put into practice from 1997 under New Labour. The idea is similar to a mortgage. A “special purpose vehicle” is set up consisting of banks, insurers and advisors to provide the capital and a consortium is made with a contractor. After the asset is delivered the government pays the consortium a fee over a period of approximately 25 years. At the end of this period the government owns the asset. Like a mortgage at the end of the period of repayment the total repayments represent several times the original capital borrowed. The advantage of such a scheme for the government is that the debt for the original capital is not on government books and the Public Sector Borrowing Requirement appears to be smaller. The expenditure is just kicked down the road with the day of reckoning postponed to the future. The asset such as a hospital, school, prison etc. is, however, owned, maintained and operated by the consortium which raised the capital and built it for the period of repayment. The government becomes the client who pays for all this. Once the project is set up and government payments start the debt is often auctioned off in the financial sector to banks, private equity groups or pension funds. That these schemes would be cheaper than direct government procurement. Direct government procurement was notoriously inefficient. Defence procurement is the prime example, but an infrastructure project which illustrates this was the extension of the London Underground Jubilee line. This was 2 years late and £1.4bn over budget. That PFI would be more efficient, projects would be delivered on time. Carillion’s construction of the Liverpool Hospital was already a year late when the group collapsed. That risk was removed from the government to the consortium. That maintenance would be better. A recent report by the government National Audit Office (NAO) finds that all these claims are false. It finds that billions of extra costs have resulted from PFI contracts with no clear benefit. All PFI contracts are between 2% and 5% more expensive than the government would pay for borrowing the capital itself and involve significant extra fees to banks, insurers, lawyers etc. The extra 2% to 5% goes to the equity investors in the “special purpose vehicles”. Construction is not more efficient, and nor is maintenance better. In 67% of cases the operating costs were higher than if the state had operated the facility. Though some of the risk reverts to the consortium or the contractor, as is apparent with the Carillion collapse, the government still picks up a significant part of the risk of failure having to sort out the mess of its procurement contracts, find new contractors for major projects and bail out the pension funds. The whole process represents a transfer of wealth from the government to private capitalists to prop up falling profit rates. The Labour Party says it will nationalise all PFI contracts and to re-nationalise utilities which have previously been privatised. As mentioned above, the lawyers who set up the PFI have ensured that they are extremely expensive to scrap which means that most of them won’t be nationalised if Labour comes to power. The nationalisation of the main utilities, rail, water, electricity and the postal service is, however, now a key Labour promise and may well be carried out. Privatisation of these utilities, which preceded the PFI schemes, has like the PFI resulted in an enormous transfer of wealth from customers and the government to the capitalists to whom they were sold. The reasons for the nationalisation of these and other key utilities in the period after the Second World War needs to be remembered. Rail, electricity supply and coal mining were examples of essential industries which had been run down and starved of investment for decades. Nationalisation allowed the state to recapitalise and reorganise these industries and at the same time provided generous pay-outs for the capitalists who had previously owned them. During the reconstruction period following the war the state was able to rationalise and invest in these nationalised industries and used them to provide cheap services for the rest of UK capital. The arrangement worked for UK capitalism as a whole. Cheap services allowed the profits in the private sector to be higher. However, at the end of the 1960s as the post war reconstruction period came to an end, the state lacked the capital to invest in these industries and they were run down leading to a crisis of under investment. The solution the government decided on in the 80s was to mobilise private capital to regenerate them through their re-privatisation. This involved the government clearing the utilities’ debts and selling them off at knock-down prices. This represented another subsidy to private capital from the state. Since these utilities were often monopolies, the state has tried to police them through control boards which control prices they charge in relation to investment and performance. After about three decades of privatisation we are now at a stage where most of the privatised industries are short of investment, heavily in debt and are delivering poor services. Meanwhile they pay out most of the profits they make in dividends to shareholders. The regulating bodies the government set up to control them have proved ineffective and allowed the capitalists who now own them to draw a steady source of income while running up enormous debts. The water companies, for example, were privatised in 1989 debt free since the government took on the entire debt. Today they have a combined debt of £42bn. Thames Water, the largest company, paid itself and shareholders dividends of £1.6bn in the period 2006 to 2016 while saddling the company with £10.6bn in debt and its pension fund with a deficit of £260m. Its previous owners Macquarie, an Australian bank, received returns of between 15.5% and 19% during the 11 years they owned the company. Macquarie sold its final stake in 2017 to a Canadian pension fund and the Kuwait Investment Authority. Present owners include 11 pension funds, the Abu Dhabi Investment Authority and the China investment corporation . In addition the company has paid no corporate tax in the last 10 years because of its Byzantine tax avoidance structure which includes two companies based in the Cayman Islands. It could be argued that Thames Water is not typical of the privatised utilities but the differences are only ones of scale. The talk of re-nationalisation of all utilities shows the wheel has nearly turned full circle. It also shows that the problem these utilities, and PFI contracts face is not the form of ownership but the capitalist system itself. John McDonnell, Labour Shadow Chancellor, announcing Labour’s policy of re-nationalisation of rail, electricity, water and postal services said that re-nationalisation would bring these organisations back into the hands of the people who work them and use them. In fact these organisations were never in the hands of the people who work in them or use them. They were previously in the hands of the state. We now have private capital in control whereas before we had state capital. It was private capital’s failure to invest which brought about the nationalisation of the utilities in the 1940s. It was then the state’s failure to invest in and maintain these utilities which led to their re-privatisation in the 1980s. It is more or less the same problems of failure to invest and maintain which are now driving the calls for re-nationalisation. All we are seeing is different forms of capitalist control leading to a similar result. Under both systems operation is for profit not the provision of services and the needs of the users nor the benefit of the working class population as a whole. The left wing of capital’s political class look at the failure of Carillion, the PFI and the operation of the privatised utilities, and express their outrage at the greed of the bosses and their capitalist masters. They pretend that capitalism should be moral or fair. They pretend that nationalisation is socialism whereas it is, in reality, simply a different form of capitalism, namely a form of state capitalism. They tell us, the PFI and debacle of Carillion are not the way capitalism is supposed to work! Unfortunately all this is the way capitalism is supposed to work, and the way it worked under state control also. The system is supposed to transfer wealth created by the working class to those who own capital and this is precisely what has been happening with Carillion, with PFI in general and with privatisation. PFI and privatisation are simply mechanisms to enable this to occur in an era of globalisation. 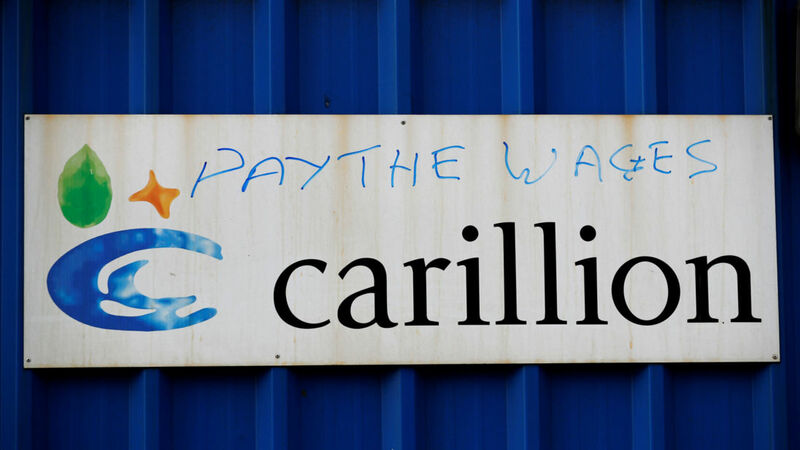 They differ from simple exploitation of the workers Carillion itself exploits, either those it employs directly or through its subcontractors, in that a lot of the wealth transferred is produced by workers in the rest of the UK, or global economy, taken by the government via taxation and handed over to Carillion. In its essentials this is the way capitalism works and is supposed to work, and will continue to work until the system itself is overthrown, wage labour abolished and production for need established. Barclays, Santander, Lloyds, Royal Bank of Scotland and HSBC have all lent money to Carillion. Figure quoted in Financial Times 15/01/18.